Filed under Reviews; 8 comments. I recently rewatched the 1998 film The Truman Show. I've often considered the movie, ostensibly a comedy, to be Jim Carrey's first dramatic role, representing a turning point for the actor similar to what Stranger than Fiction did for Will Ferrell. (The two movies aren't all that different in plot, either.) Not to say that comedic roles are of lesser value, or that Carrey wouldn't or shouldn't continue to capitalize on that strength; but The Truman Show demonstrated that he was not limited to that genre. Inspired to trace his growth, I turned to his next dramatic film, The Majestic. One morning in 1953, Jim Carrey wakes up on a California beach shore with no memory of anything that's come before. The residents of the nearby sleepy town of Lawson find the amnesiac Carrey to bear a striking resemblance to Luke Trimble, one of their 60+ young men who died in World War II. Since Luke's body was never found, and a decade can age both a person's face and his father's and fianceé's memories, it seems plausible that their lost son has returned. But there is a fundamental flaw: this is not the movie's opening. We are instead introduced to Peter Appleton, a Hollywood screenplay writer whose career is a victim of the Red Scare. Depressed and with nowhere to turn, he goes for a drive one rainy night, resulting in the accident that leaves him on Lawson's shore. As a result, the audience finds no mystery in Carrey's identity; even as we can relate to the hope that he is Luke, we know that he is not. This approach is not without benefit, as we are able to cringe as we see the townsfolk expect of "Luke" what only we know he cannot provide. But if we are to be introduced to Carrey first as someone who is decidedly not Luke, then further exposure to Appleton's life would've made the development of Carrey's character more marked. Despite that one scripting decision, characters are what the film is all about, and the director knows how to use them. 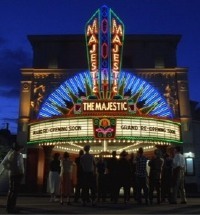 The Majestic is directed by Frank Darabont, who later relied on some of the same talent in The Mist. Luke's fianceé, played by Laurie Holden, has a worldliness that sets her apart from the townsfolk, yet they share a faith and hope in common. Jeffrey DeMunn as the town's mayor is more optimistic than a stereotypical politician, yet two scenes — one in which he speaks not a word — subtly make a more serious character of him. Its these smaller roles that are perhaps the show's strength: though Carrey is the star, The Majestic is ultimately an ensemble show. Carrey is given scenes with almost every character, major and minor, giving a depth to what would otherwise be throwaway extras. Even smaller parts by Bob Balaban and Bruce Campbell find their talent effectively exploited. Everything ties together in a story that gives its characters numerous obstacles, but not without believable means for resolution. The climax comes in a scene that is so tense, and in which Appleton is so nervous, that I was overwhelmed by the tension and had to pause the movie to calm down before proceeding. For something that powerful, the buildup is worth it. 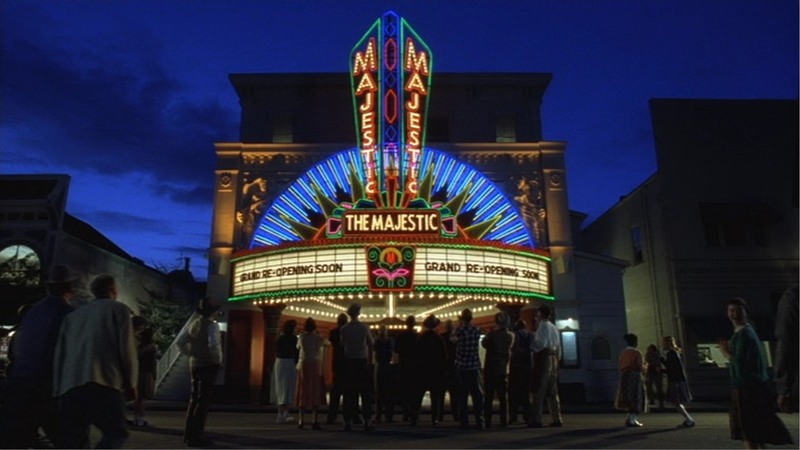 Otherwise, at 2.5 hours, the film might be a bit long — and oddly, and the titular Majestic, a theater Luke Trimble and his dad used to run and which Carrey works to restore, is featured prominently for only 20 minutes, starting 1:15 into the film. But ultimately, though I was initially surprised by much of the plot, many of those surprises proved to be pleasant ones, as even if I didn't know what the director was doing, he proved that he did. This cross between Random Harvest, Pleasantville, and Mr. Smith Goes to Washington (with an incongruous tip of the hat to Saving Private Ryan near the end) deserved better than the reception it received upon its 2001 release. Even if the script is as unoriginal as the critics decried, Carrey's performance had me on the edge of my seat, something Ace Ventura never could've done.